home › Natural gas, good help for us! Natural gas, good help for us! It was those years between ’80 and ’90 and in the Italian TV there was a commercial with a similar slogan: “Natural gas is here to help!”. 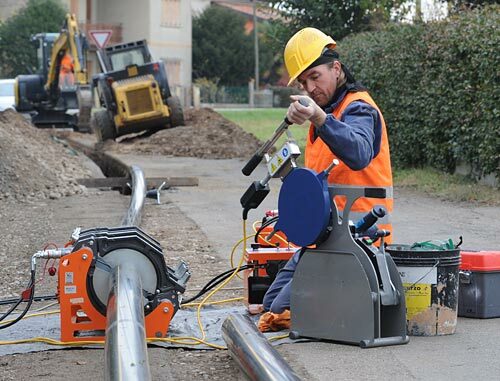 There were many investments in order to create an underground natural gas network for the majority of the Italian urban areas. Many cities started to create the firsts networks using polyethylene pipes: natural gas in any house became something familiar. Today, after 30 years we can make a balance and see how many benefits have brought those investments making difficult to find urban areas without gas connection. 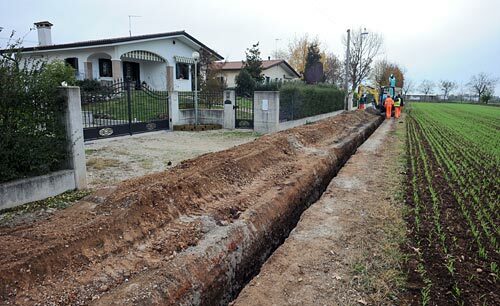 The two job-sites we are visiting in Istrana, area of Treviso ITALY, take part of a methane network plan in two new residential areas and where the company Tonello s.r.l is taking care of the job. 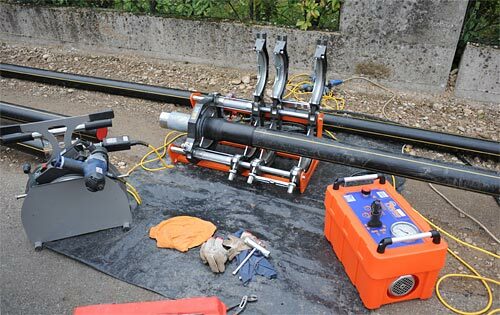 In the first job-site, with the the snowing Alps as background they are welding a 300 mt long polyethylene pipe network with PE80, diameter 125 mm and SDR 11. Here we find an untiring Delta Dragon 250 finishing a welding cycle. We are talking about a not that young welding machine, produced by Ritmo some years ago, but still doing its job without troubles. 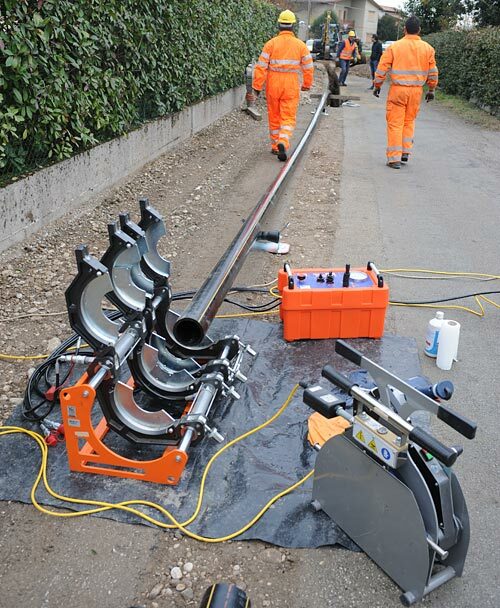 The reliability of this machine, together with the periodic maintenance mandatory by law, have made of this machine a real workhorse. Moving few miles away, the shimmering orange color, of a new Basic 250, comes out since the cloudy day. The pipe they are welding has the same characteristics of the one we talked about previously, but here they are making a 900mt long ring. The job phases are followed in such careful way by the welder that even his colleagues tease him because of his emotional attachment for the new machine. I had to exchange some impressions with the welder who started his conversation with: “This is a perfect machine, I love it… and it’s true I never let other people to touch it. I must admit that it’s easy to believe him since these are just the characteristics that the clients appreciate more in this welding machines. The operations go on with no troubles and to avoid discomforts to the population, the affected section is excavated, welded and buried. When it was time for me to go home, on the way back I kept thinking about that nice serene atmosphere between colleagues. At the end of the day, if everything goes right, why to be sad?